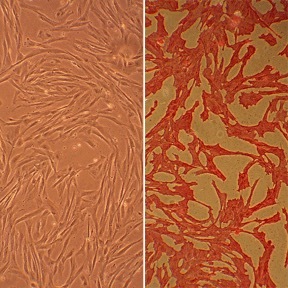 Canine Aortic Smooth Muscle Cells (CnAOSMC) are derived from tunica intima and tunica media of normal canine aorta. They are cryopreserved at second passage and can be cultured and propagated at least 10 population doublings. (Click to Enlarge) Canine Aortic Smooth Muscle Cells: CnAOSMC. Isolated from the main vessel supplying oxygenated blood to the circulatory system.